"Military Action in Persian Golf"
"...read my lips. No new taxes." "I do not like broccoli. And I haven't liked it since I was a little kid and my mother made me eat it. And I'm President of the United States and I'm not going to eat any more broccoli." Like so many who have risen to the highest office in the land, George HW Bush had a fascinating, even heroic life. Like so many of what is called "the Greatest Generation", Bush rose beyond his circumstances to accomplish his many achievements. When your circumstances include being the son of Ohio banker and future Connecticut Senator Prescott Bush, rising beyond them is no easy feat. George was a student leader at the Phillips Academy in Andover, MA. and was accepted to Yale before WWII. 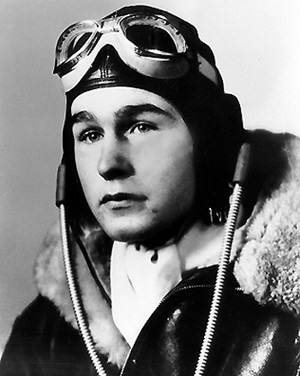 After Pearl Harbor, Bush instead chose to enlist in the Navy after graduating from Phillips in 1942. He was selected for pilot training, and just before his 19th birthday he became the youngest naval aviator to date. Bush flew 58 combat missions in torpedo bombers, was shot down and rescued by the USS Finback, and receive the Navy Flying Cross. Because of his combat experience he was reassigned as an instructor of torpedo bombing in Norfolk. He was discharged soon after VJ Day. 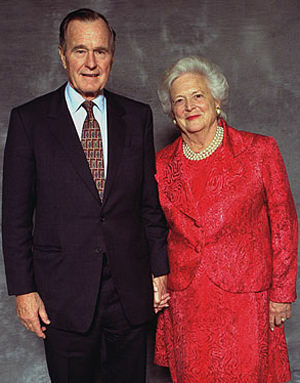 Before leaving the service, Bush married Barbara Pierce. The marriage would produce six children (the oldest, George W Bush, would become the 43rd President of the United States). After leaving the service Bush decided to enter Yale on an accelerated program that would allow him to graduate in two and a half years. 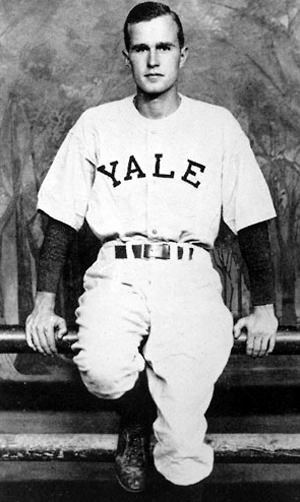 He was captain of the baseball team and, like his father, initiated into the Skull and Bones Society late in his Junior year (Prescott Bush was among the Bonesmen who allegedly dug up and stole Geronimo's skull.) The younger Bush graduated in 1948 with a degree in Economics. After graduating, Bush moved his growing family to West Texas and went into the oil business. He made his first million dollars by the time he turned 40 in 1964, but by now his became interested in politics. In 1966, he was elected to represent Texas in the House, and President Nixon convinced him to run for the Senate in 1970. However he lost his senatorial run, and Nixon selected him as Ambassador to the United Nations. Bush chaired the Republican National Committee through the difficult days of Watergate, and Nixon's successor, Gerald Ford selected him to be envoy to China. Bush's time in China seems to have benefited relations between the two powers, and in 1976, Ford recalled him to direct the Central Intelligence Agency. 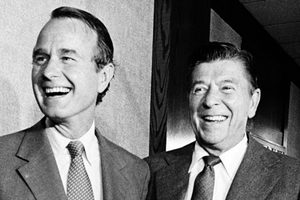 In 1980, Bush beat Ronald Reagan in the Iowa Caucus, although Reagan would go on to win the nomination. Bush was selected as his running mate and served as Vice President for both Reagan's terms. When Reagan left office, Bush was his obvious successor. During the Republican convention, Bush gave his "Thousand Points of Light" speech, and made the promise that would later haunt his presidency: "Watch my lips, No New Taxes." Bush served in changing times; the Berlin Wall fell, and the Soviet Union collapsed early in his term, but the deficit remaining from the Reagan years haunted the economy. Eventually, Bush was forced to renege on his promise of No New Taxes. In 1989 Bush ordered "Operation Just Cause" which removed Manuel Noriega from power in Panama. "Just Cause" was the first major operation by the US military in 40 years that was not Cold War related. In August of 1990, Iraq's Saddam Hussein ordered his forces to invade oil-rich Kuwait to the south. President Bush responded by forming a coalition, beginning with Saudi Arabia, which also feared Hussein's aggression. The Allied Coalition began a bombing campaign on January 17, 1991, which lasted four weeks. The ground invasion began on the morning of Feb 24, and Iraqi forces were driven from Kuwait in less than 100 hours. At this point, Bush ordered a the offensive to halt, for which he later received criticism. The halt allowed a large portion of Iraqi forces to return home, and the failure to remove Hussein from power allowed him to regroup and cause trouble for more than a decade. Bush ran for reelection in 1993, still riding a wave of popularity from the Gulf victory. However, the Clinton campaign portrayed Bush as being "out of touch" with the common man as evidenced by the troubles in the economy. The Bush Campaign may have overcome this, but third party candidate Ross Perot took many of the votes the Republicans needed. 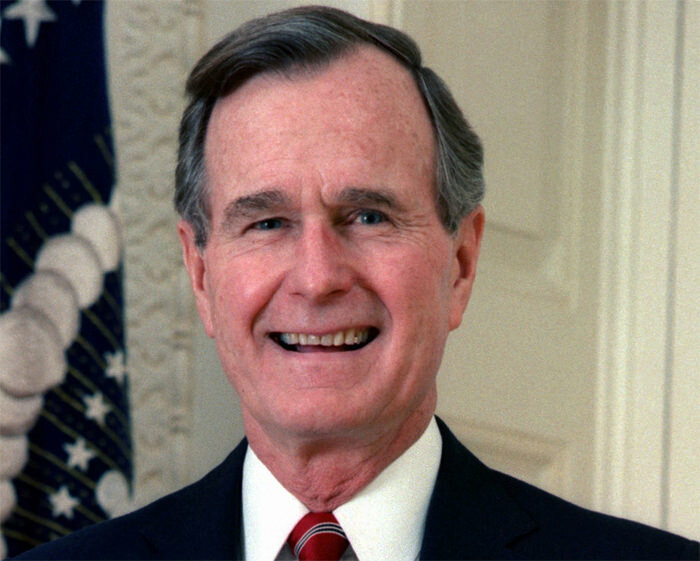 George HW Bush is currently the oldest surviving US President. Hi, I really love the website, it's a great place to find little bits of history to enjoy. Ye-ow! Arrived this morning. That was fast! Thanks! I'm sure I will love these as I have everything else you've sent. Back to you when I run dry.